Filleting a fish doesn’t look easy or particularly tempting but it’s one of those cooking skills that every budding chef needs to master. Once you know what you’re doing and have a bit of practice, we promise it will quickly become second nature. So to help you out we spoke to our new favourite Chef, food writer, and blogger, Tess Ward, to get her tips on how to fillet a fish. When you’re cooking with fish, the fresher the better, so after buying from your local fishmongers or supermarket fish counter, try and cook your fish straight away. You can identify a fresh fish by its clear, shiny eyes, bright red gills, and firm scales. It should also still be slightly slippery with a stiff tail and should not have a bad smell. They say a good workman never blames her tools but this time we’ll let you off the hook. Filleting a fish isn’t easy but Tess says the trick is in your knife; if you have enough patience you will surprise yourself at how easy it comes. So want to know how it’s done? Tess has all the tricks you need. 1. 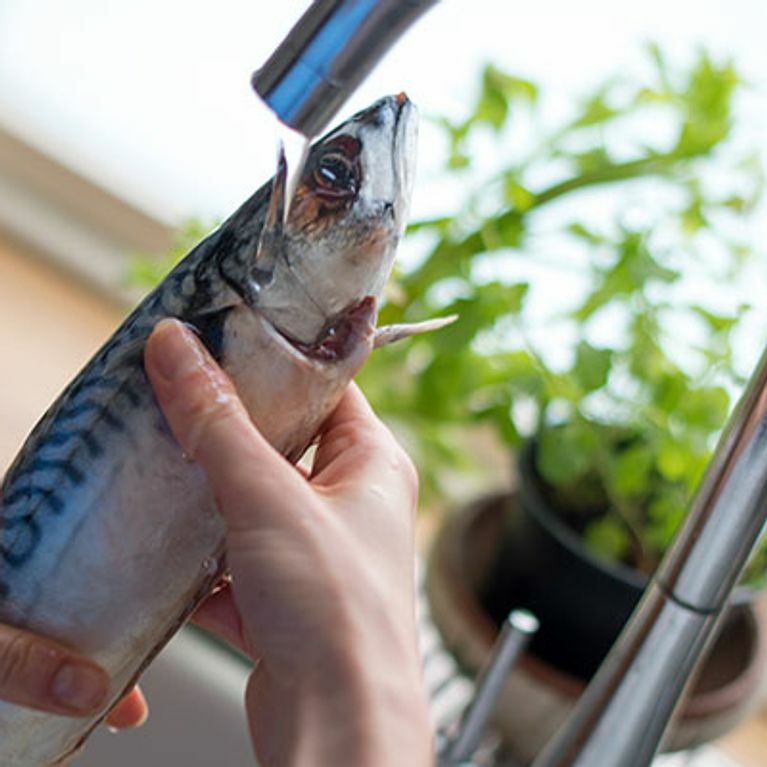 The first step is to wash the fish, inside and out, with cold water. Rinse the outside skin and the inside cavity carefully. Then lay it out on a paper towel and pat dry. Prepare the chopping board, knife and have a plate ready to place the fillets on. 2. Run the knife, from top to bottom, along the spine of the fish. 3. Identify where the ribs are and gently fan the knife out slightly, away from the centre of the fish, letting your knife tickle over the bone. 4. ​Take this slowly, cutting in a slight c-shape. You want to gently release the fillet away from the spine and rib bones. 5. ​As the fillet starts to release away, you want to bring the knife down, through the central cavity. 6. Release the fish on both the top and bottom end, near the head and tail and place on a plate. Mackerel tends to have a few pin bones, don’t worry if it looks like there are still some in the flesh, they can be gently removed with tweezers after. 7. Turn the fish onto the other side and place the knife behind the gills, to make a cut between the fillet and the head. 8. Align the knife so it runs along the ribcage, gently run it along the fish, until it releases the second fillet. Gently pull back the fillet and release it in any place where it is still attached to the bones. Then place on the plate with the first fillet. The fillets are now ready to use! For inspiration, why not look at these delicious fishy recipes. Love Tess as much as we do? You can check her out on her blog The Yes Chef, her website or Twitter page. Or if you've been inspired to get filleting, let us know on @sofeminineUK.